WASHINGTON — The House on Tuesday voted unanimously to allow military travelers on official duty to get a special preference to move through airport security checks faster. The bill, approved 404-0, would give the Homeland Security Department six months to devise a preference system for the Armed Forces. The legislation went to the Senate. If the bill becomes law, the earliest beneficiaries would likely be troops returning from Afghanistan next year and their family members, who also would receive preferential treatment. The government already has initiated, and is expanding, a more intelligence-driven trusted traveler program for civilians. Participants include travelers in American and Delta airlines' frequent flier programs as well as people who are part of three other programs. These people volunteer more information about themselves so that the government can vet them before they arrive at airport security checkpoints. Chief sponsor Chip Cravaack, R-Minn., said it takes longer for men and women in uniform to pass through security because of their gear, medals on their uniforms and boots that must be unlaced. Allowing them through security more quickly would speed up the waiting time for those not part of a preference program, he said. While Homeland Security would establish the new preferential system, Cravaack envisions troops not having to remove boots, belt buckles, bulky military jackets and medals. Troops could go to the front of the line, or a separate line could be created. "This falls in line with the pilot program" now under way," Cravaack said. "I was an airline pilot for 17 years. We would go to the head of the line. I saw people who were not exactly happy with that. "But the main emphasis is expediting troops going through a security process that wasn't made for them." Kate Hanni, executive director of FlyersRights.org, said her passenger rights group "strongly supports expedited screening for the military and that should be extended to all law enforcement, DOD folks with security clearance and other government officials with security clearance." The Transportation Security Administration is currently testing a trusted traveler program at airports in Atlanta, Dallas, Detroit and Miami. The program will expand to Las Vegas, Los Angeles and Minneapolis-St. Paul over the next few months. The civilian program allows participants to go to a dedicated lane. The traveler will provide the TSA officer with a boarding pass that has information about his or her vetted and trusted status embedded in the barcode. A machine will read the barcode, and if the traveler is deemed part of a "low-risk" category, he or she will likely be able to keep on belts, shoes and jackets and leave laptops and liquids in bags when going through the screening process. In addition, TSA on Nov. 15 began a test at the Monterey Peninsula Airport in California, allowing members of the Armed Forces to present their Defense Department identification card for scanning. The experiment is only to see if the scanning system works, but there is no change in screening procedures. Although it's a policy, not law, the TSA already makes some accommodations to service members.in uniform with a proper identification card. They are not required to remove their shoes or boots unless they set off an alarm. Family members can obtain gate passes to accompany departing troops or meet those returning. The agency expedites screening for wounded troops. SALT LAKE CITY (AP) — More than six decades after being freed from a Japanese prisoner of war camp, a Utah veteran was compelled to relive the horrors and triumphs of his World War II experience this month when he received a mysterious package containing seven military medals, including the Distinguished Service Cross and Silver Star. The medals have become a source of pride for retired Army Capt. Tom Harrison, 93, since they arrived in a box with nothing more than a packing slip from a logistics center in Philadelphia on Nov. 4, which happened to be his 65th wedding anniversary. But they have also refreshed painful memories of the Bataan Death March, POW camps and the comrades he lost during the war or in the years since. Harrison can talk at length about his time as a soldier in the Philippines. But he talks about it much like he talks about golf, focusing on small details — be it the flight of a well-hit tee shot or the day he met Gen. Douglass MacArthur — and the people that surrounded him. He doesn't dwell on his own valor. After the bombing of Pearl Harbor forced the United States into the war, Harrison spent months fighting the Japanese before American and Filipino troops surrendered at the Battle of Bataan. He eventually survived, without lasting physical injury, the Bataan Death March and three-plus years as a Japanese prisoner of war. "It brings back memories, but also makes you feel like somebody appreciated your service," Harrison said while sitting in his living room with the medals. "It also reminds me of the people I served with in the Philippines. I'm the only survivor from my unit now. I've lost most of my friends." About 20 years ago, Harrison "shook the cobwebs loose" on his war experiences by writing a book called "Survivor." That has made it easier — but not easy — to talk about the suffering, the disease and the starvation that defined the years of imprisonment. The medals prompted new interest from his family about the war, Harrison said, although he is reluctant to talk at length about his personal experiences. Instead, Harrison holds up a Presidential Unit Citation as one medal he was particularly pleased to receive because it recognized the soldiers he served with and trained. His leadership and bravery earned him two of the Army's highest honors, the Distinguished Service Cross and Silver Star. While those medals are only given for extraordinary acts of selfless valor, Harrison said he doesn't remember — or is reluctant to explain — what he did to earn them. "I don't like to talk about what makes a hero. It's not something I like to broadcast," Harrison said. "But my kids are impressed, and my grandkids say they (the medals) are 'awesome.'" It hasn't been uncommon for World War II veterans to receive medals decades later because relatively few were actually given out during or immediately following the war, said retired 1st Sgt. Dennis Meeks, a customer service manager for the South Carolina-based Medals of America, a company that works with military officials to distribute medals to veterans. Instead, veterans were given ribbons because precious metals such as bronze and silver were needed for more pressing wartime needs, Meeks said. Additionally, a number of medals were granted in the years after service members were discharged. That means many veterans needed to apply to receive their medals, and a strong majority of them did not. "The Greatest Generation just put this war to the side when it ended," Meeks said. "They had other concerns, like starting families and careers." As for Harrison's medals, however, it remains a mystery as to who actually requested them. His son, Peter Harrison, said nobody in the family has taken credit for doing it, although they have celebrated the medals with a family dinner. Army officials didn't respond to email requests for comment and weren't available on Friday because of the Veterans Day federal holiday. Eventually, the medals will be displayed in Tom Harrison's modestly decorated but spacious home, which is about 50 yards from the 7th hole of the Salt Lake Country Club. They will serve as reminders of a well-lived life for him, his wife and his family. "They add excitement to an otherwise sedentary life," he said. "I can still remember it all, even after such a long time. I don't like to bring it up, but I'll talk about it if asked." 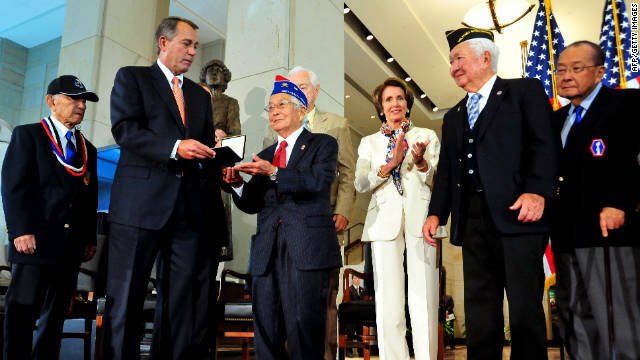 Washington (CNN) -- Nearly seven decades after the attack on Pearl Harbor, thousands of Japanese-American World War II veterans were honored Wednesday at a Congressional Gold Medal ceremony held at the U.S Capitol. In a rare moment of unity, Democratic and Republican Senators and members of the House of Representatives praised Japanese-American soldiers of the 442nd Regiment Combat Team and the 100th Infantry Battalion and veterans of the Military Intelligence Service for their contribution to the war. "Aloha and welcome," said House Speaker John Boehner, R-Ohio, at the start of the invitation-only event inside the Capitol's Emancipation Hall. About 1,000 people witnessed the ceremony in person, including several aging Japanese-American honorees and their families who waited years for this day. When World War II began, Japanese-Americans were not invited to serve. Two years into the war, the U.S. military created an all-volunteer Japanese-American combat team who soon adopted the slogan "Go for Broke." Most of its roughly 20,000 members were born in the United States to Japanese-born parents. They went on to become one of the most decorated American units in the war, yet when they returned home, many faced discrimination. House Minority Leader Nancy Pelosi, D-California, said Wednesday's "long-overdue honor" is now "bestowed on American heroes." "You fought not only the enemy, you fought prejudice, and you won," Pelosi said. Rep. Adam Schiff, D-California, said the ceremony "demonstrates the greatest of America, a nation that recognized that it made mistakes, corrected them and moved on to become a stronger country and we are proud to defend the freedoms and ideals that this country represents." President Barack Obama signed legislation last year approving the creation of a Congressional Gold Medal for Japanese-American veterans. The medal states in part, "The United States remains forever indebted to the bravery, valor, and dedication to country that these men faced while fighting a two-front battle of discrimination at home and fascism abroad. Their commitment demonstrates a highly uncommon and commendable sense of patriotism and honor." One recipient, Sen. Daniel Inouye, D-Hawaii, received a standing ovation when he rose to speak at the event. He said the road to recognizing Japanese-American World War II veterans "has been a long journey, but a glorious one. I'm certain those who are resting in cemeteries are pleased with this day." Inouye, who lost his right arm while leading his men of the 2nd Battalion, 442nd Combat Team in an attack against German machine gun nests in Italy, received the Medal of Honor 55 years later, in 1999. George Otsuki, now almost 92, who was a sergeant serving in the 442nd, called the recognition "wonderful." "The public found out what we did," he told CNN, "and that's the main thing." Frank Mizufuka, who was born in Los Angeles and served as a sergeant in the same unit, said "it was a once-in-a-lifetime, extraordinary event." Mizufuka, 89, said he spent a year in a hospital recovering from a chest wound he received in combat. CFSO Note: America is a land of immigrants. Even in times of war, immigrants for "enemy" lands can still be, and prove themselves, loyal Americans. Sadly, in today's Department of State, the Bureau of Diplomatic Security still has not grasped the concept.